A wide range of horse race betting apps can now be downloaded for the Samsung Galaxy S5, Sony Xperia Z2 and LG G3. These racing apps help users find the best betting odds and even offer horse racing tips from top jockeys. One of the biggest advancements in the mobile world has been the rise of Android. The company is one of very few that has managed to rival and even excel Apple’s dominance in this market. As more mobile companies start to introduce the Android operating service to their hardware, more betting companies are starting to make their mobile betting apps available specifically for these devices. What you will find from the majority of bookmakers is that the apps are pretty much identical, no matter which operating system you are running. The only thing that might be different is that a lot of bookmakers actually designed their betting apps to fit dedicated screens, which will vary much more with Android products as compared to that of Apple. Popular Android devices include the Google Nexus 7, Samsung Galaxy Note and the Moto G.
Horse racing has been widely regarded as one of the main reasons as to why mobile betting has had the success it has had. The sports are so vast that it only takes a couple of minutes browsing a bookmaker to see how many markets and features it runs for that sport. What we will say is that the sport isn’t the be all and end all when it comes to mobile betting. As you would expect the number of sports and markets that are covered these days is quite staggering and more often than not, will be as many as you find from an online bookmaker. What you’ll find from your Android horse racing apps is a wide variety of features and markets to bet on. No longer are betting apps just simply somewhere that you can place a bet; they are much detailed than that. A lot of the information below in this article will outline just what you can get from your mobile, even directly from the betting app. Paddy Power is the ultimate mobile betting app for horse racing fans. On the top right hand corner of the app you will see a little speaker icon that will bring you to the "Audio Centre", which provides live updates and commentary of races in UK, Australia, Ireland and from other racetracks around the world. This service is free and you don't even need an account to listen. Additionally you can watch any UK or Irish race on your Droid by simply placing a $1 bet. The PP race card is nicely designed and offers all the information you'll need to pick a winner. The rating section give you a star rating for each horse and a prediction for how it will fare. We especially like the "Nag Me" service that allows you to tag a particular jockey, trainer or horse so you'll be notified the next time they're competing. Paddy Power also run a wide range of horse racing promotions and exclusive iOS/Android offers. Unfortunately, horse racing fans in the United States don't have access to the major European bookmaker apps. Mobile sports betting and racing apps for the U.S. market are not quiet as technologically advanced but thankfully they are improving. The BetOnline racebook apps is easily the best option for anyone looking to wager on a horse race in the United States. The homepage of the racing section give you a quick overview of the days featured races along with a list of all upcoming races, broken down into Harness and Thoroughbred categories. Once you've selected the race you'd like like to have a punt on, you'll be given the option of choosing a bet type between: Straight, Pick 3, Exacta, Trifecta, Daily Double and Superfecta. The racecard also contains a shorts betting guide that explains the various bet types and terminology. $2 is the minimum bet that can be placed, while maximum bets exceed $1,000 for many races. 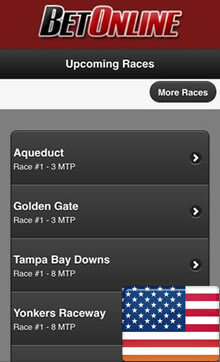 Sadly none of the U.S. friendly bookmakers apps stream U.S. horse racing to Samsung Galaxy, HTC or any Android devices. BetOnline is a browse based mobile sportsbook so there is no download required. This means it will also work on less popular devices like Blackberry or Nokia Lumia (Windows Phone). One thing that has seen a massive upheaval for Android products is the introduction of tipping sites. You wont necessarily get many apps for this, although OLBG (Online Betting Guide) do run a specialist app that includes a number of tipster services. It is worth noting that some of these are just from regular users of the app, so make sure you know who’s tipping what. You can also find tipping sections from some of the bigger bookmaker apps. Obviously these are all available from the Android store or can be downloaded by visiting each bookmakers mobile device. With Android betting devices you can find a number of horse races in which you can steam direct to your mobile device. The quality is actually pretty good on the whole, but some are better than others. Often you will find the apps include a mix of live races and even archived races for each horse. Something like the Racing Post app for Android will be your best bet for archived races whilst the live streams can be found from a number of bookmakers. A quick word of warning for live streaming is that you need to be aware most races will include a time delay of between 10-30 seconds. 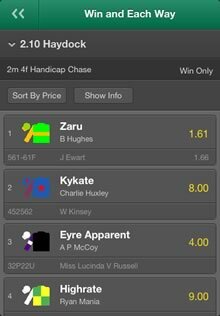 This makes betting in-play a little trickier as over the course of one race, a lot can happen in this time frame. If it is live betting that you want to target then live streaming via your mobile probably isn’t going to give you the best results. The OddsChecker.com app is your best bet for odds comparison as an Android user. They cover a huge amount of horse races from around the world and are pretty up to date as well. Race Guru is another free app that can be downloaded from the Android App Store and works pretty well for the most part. It probably doesn’t have the finish or depth that oddschecker.com has, but will serve a purpose if you are looking to bet on races from the UK and Ireland. A nice addition to this app is the inclusion of a racing trends section, to see where the money is going for each horse for a specific race. It will also outline how the odds have fluctuated since the market opened. What’s been interesting to see in the development of horse racing apps for Android is just how far they come in terms of what’s on the race card. The race card is going to be the HUB for most betting apps. What you will find is that the Android apps are going to vary in the amount of information each card holds. Some of your bigger bookmakers have some of the most comprehensive racing sections in the world. In fact, you could use the bookmaker apps almost exclusively for your racing picks and needs. That being said, there are bookmakers who have failed to pretty much take advantage of these huge opening in the market. Some will just offer you a betting market to place your bets, and whilst this is fine as its essentially what most punters want to do, its hardly going above and beyond in terms of feature rich extras. Downloading a mobile bookmaker app means you always have access to racecards, form guides and betting tips from major horse racing publications. You will be able to find the majority of racing results from a number of the higher end betting apps, but aside from that you can access pretty much any sports website for these types of things. Whilst apps are always handy to use, they often aren’t the quickest to be updated, whereas compared to established sites like Sky Sports, BBC Sports and Racing Post (read our full Racing Post review), these will be able to sort you out in a much more efficient manner. Similar to the racing results, the news on races can be found from these guys as well. Apps will probably play a better role in providing news as its doesn’t have to be updated as quickly, but if you can get access to the websites (or mobile versions) then they should work out better for you long term. Computer predictions are something that’s relatively new to the industry but can provide a reasonable amount of information if you are unable to find the time to form your picks for yourself. The Racing Post often includes them into their betting tips section, as do some of the larger bookmakers. As an Android user, bookmakers will often target you to sign up to their site using their dedicated Android app. To do this a series of enhanced odds, betting promotions and offers will likely be offer. Spend some time searching through the app to see what’s on offer to you as a mobile user. If you cant initially see what’s on offer before signing up then make sure you contact customer support first, as its likely you there will be something you can claim using your Android device. Why are some apps on offer for iPhone and not Android? Unfortunately, the nature of the betting industry would suggest that there are more apps on offer for iPhone users than Android users. Bookmakers often target the Apple devices first and therefore Android updates can take a while to come to fruition. That being said, over the course of the last couple of years there are now so many more apps available to Android users than ever before, with some actually only being available to Android users.